D.D. Duncan, Picasso's Picassos, The Treasures of La Californie, London, 1961, p. 241 (illustrated). The Picasso Project, ed., Picasso's Paintings, Watercolors, Drawings and Sculpture: The Spanish Civil War 1937-1939, San Francisco, 1997, p. 252, no. 39-119 (illustrated). London, Alex.Reid & Lefevre, June 1987. London, Waddington Galleries, Twentieth Century Works, February 1988, no. 13 (illustrated in color, p. 29). Throughout Picasso's career, the female model seated in an armchair was a favorite subject; in every period he returned to this theme, almost invariably choosing a current mistress for his model. These pictures form a kind of autobiography of the artist, in which one can trace both the course of his private life and his artistic development. The present picture represents Picasso's mistress, Marie-Thrse Walter. It is one of a group of paintings he made of her in the spring of 1939, all showing her seated in an armchair and wearing a large hat; in several of these works, either her clothing or the wall behind her is decorated with stars. Picasso's paintings of Marie-Thrse are perhaps the most important series in the history of modern portraiture. It was Picasso's passion for her that inspired so many masterpieces, such as the radical paintings he made at Dinard in 1927, the Vollard Suite, and the extraordinary portraits of 1932, including Le rve. All these paintings record, with extraordinary intensity, the drama of the couple's life together. According to legend, the couple first met in January 1927 outside the Galeries Lafayette in Paris; recently uncovered evidence, however, suggests that their liaison may have begun earlier, perhaps as early as November 1925 when she was below the legal age of consent. Beginning in the summer of 1931-1932, the couple began to live together, nearly full time; and in 1935, they had a child, Maya. 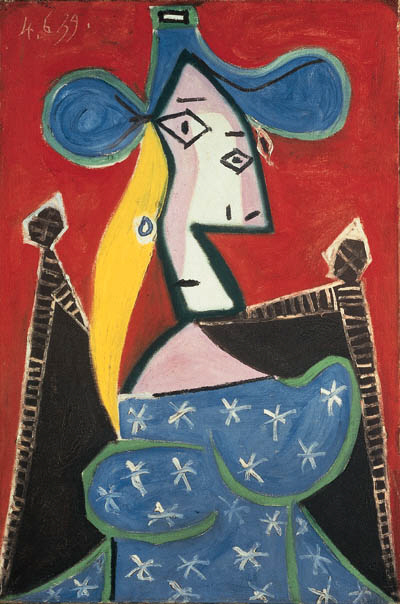 Shortly after, however, Picasso began an affair with Dora Maar. Nevertheless, he continued his relationship with Marie-Thrse for many years; during the 1940s he still saw her at least once a week. This is the case with the present picture; five days after painting it he made a portrait of Dora in which the features are closely similar and only the change of hair-color clarifies which of the mistresses is depicted (D.D. Duncan, op. cit., p. 242).